I originally wrote this article back in 2013 when we had just started the Custom Car Chronicle. At first I did not know anything about these three photo’s, or actually negatives. The only thing I was able to find out was that the license plate was from 1946, so the photos were taken either in late 1945 or somewhere in 1946. 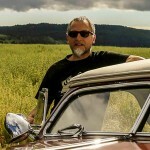 But at the time I had no idea about where the photos were taken, who owned the car or who build the car. After the article was put on-line Wayne Hadfield came to the rescue with the identification of the location. In July, 2013 Wayne Wayne Hadfield identified the location where two, or possibly all three photos were taken. Using Google street view he identified the location as 2592 Telegraph Road, Berkeley, CA. 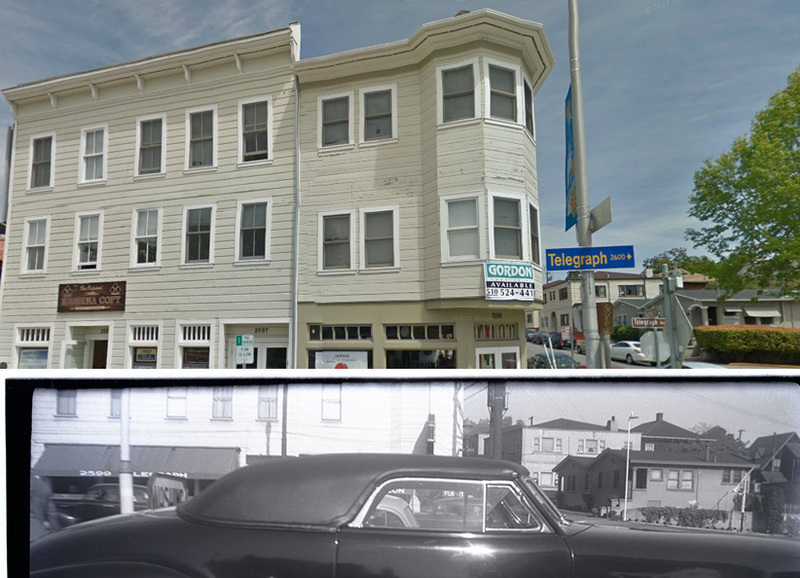 Some of the buildings in the photos are gone now, but others are still there. An image of the location can be seen at the end of the article. The unknown photographer must have not been very skilled at taking photos. He knew that the car he saw was something special, but the way he cropped the car, the fact that the horizon is not level and the subject is slightly out of focus indicate these were not taken by a professional photographer back in the mid 1940’s. On December 12, 2013 Kurt mcCormick told us that the car was still around today. Later Kurt mentioned that due to family issues the restoration did not have a priority. The good thing was that as far as Kurt could tell the car had never been changed compared to the photos in this article. 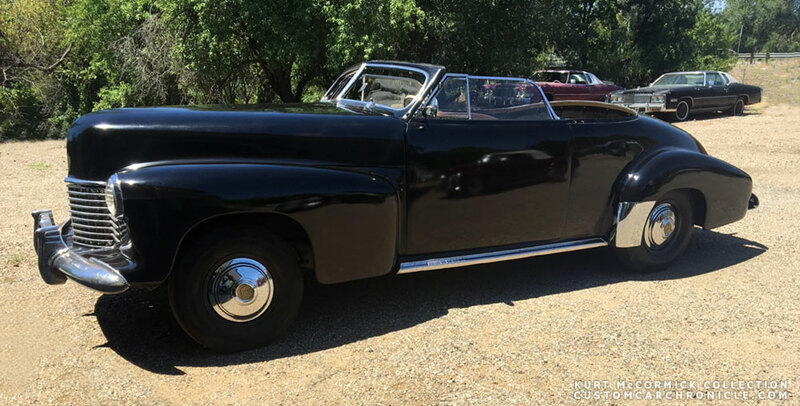 On July 03, 2016 Kurt McKormick let us know that the ’41 Cadillac is now partly restored and FOR SALE. 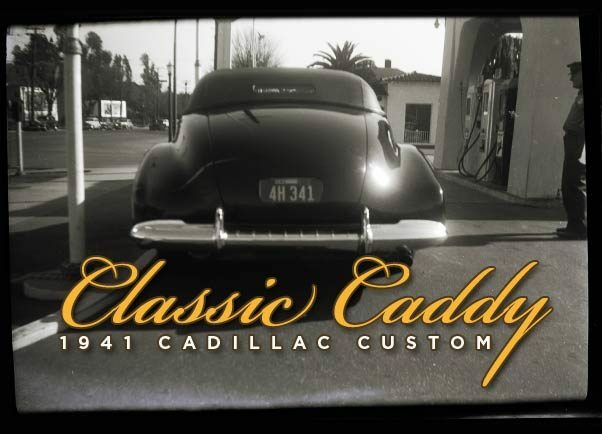 On July 18, 2017 the car was sold to a new owner in Australia who will finish the restoration of this early Custom Cadillac. 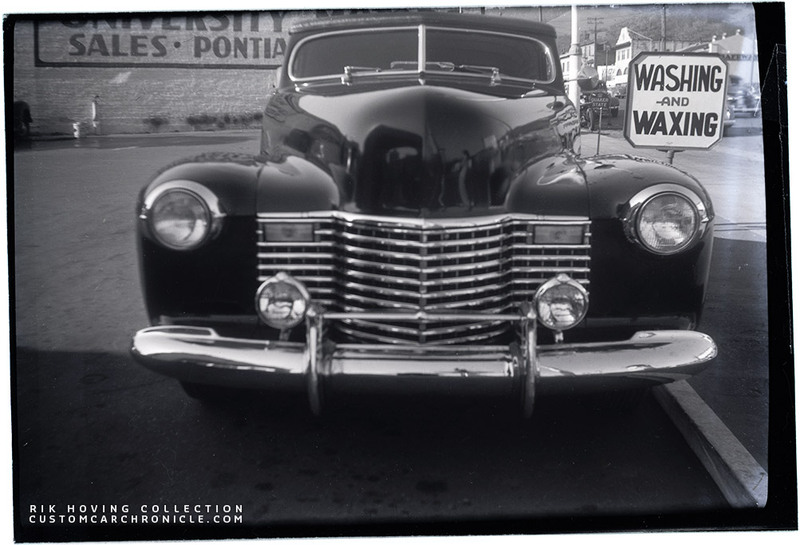 This 1941 Cadillac is a good sample of some Coachbuilding influences. 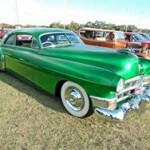 The Coachbuilding styles and techniques were copied by the young guys who started to modify their cheaper model cars in the late 1930’s and 40’s and this phenomenon would eventually be known as Customizing. The style of modifications done to this Cadillac reminds me of the Coachbuilt cars by the Coachcraft shop. Or the designs and work done by famous coachbuilders Bohman & Schwartz. 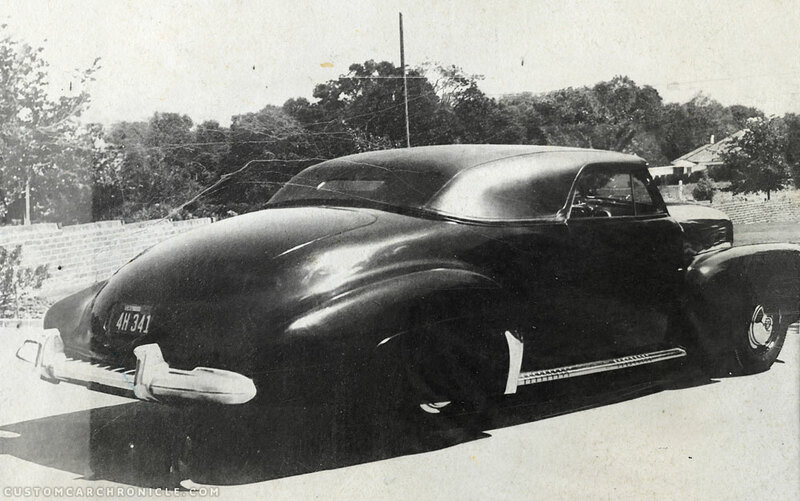 The car features a chopped windshield and a very nicely shaped padded top. 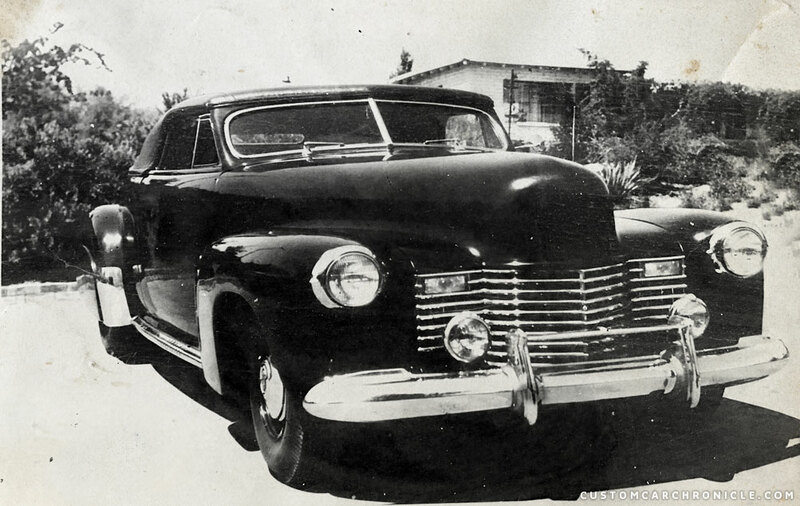 The current (Summer 2016) owner of the Cadillac (87 years) bought the Cadillac from the original owner in 1953. 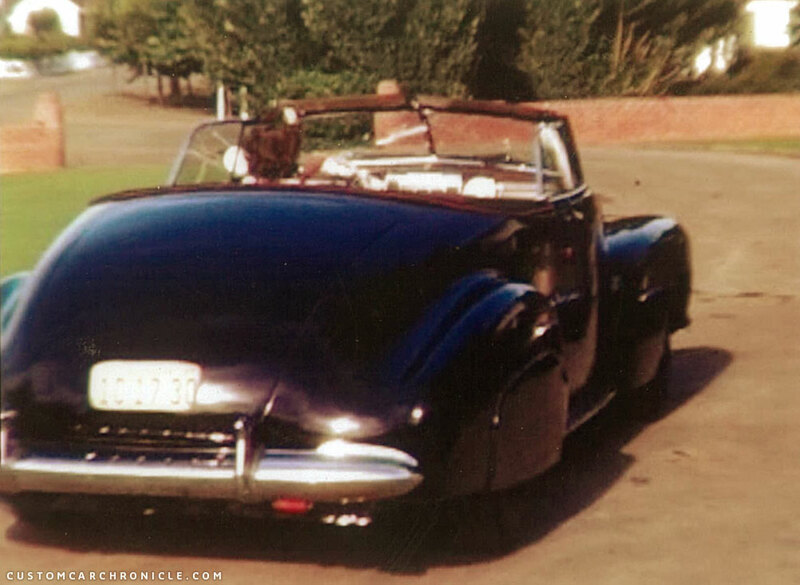 The car was customized in 1942 in the Berkeley-Oakland California area. He could not establish exactly whom the custom work was done by. Also the two sons of the original owner (also both in their 80’s!) do not recall the name of the shop who performed the original restyling back in 1942. Even the chrome outboard trunk hinges were replaced by inboard units to further clean up the rear of the car. The door handles were shaved as well as the hood side trim and the front fender trim. The rubber rock shield on the rear fender made place for a more in style polished stainless accessory unit. At the front the parking lights and hood letter were removed and the body smoothed. New parking/fog lights were added to the front bumper. All typical Custom touches. The car was lowered, but just a little bit, and is using the stock 1941 Cadillac hubcaps, which is again typical Coachbuilding style. 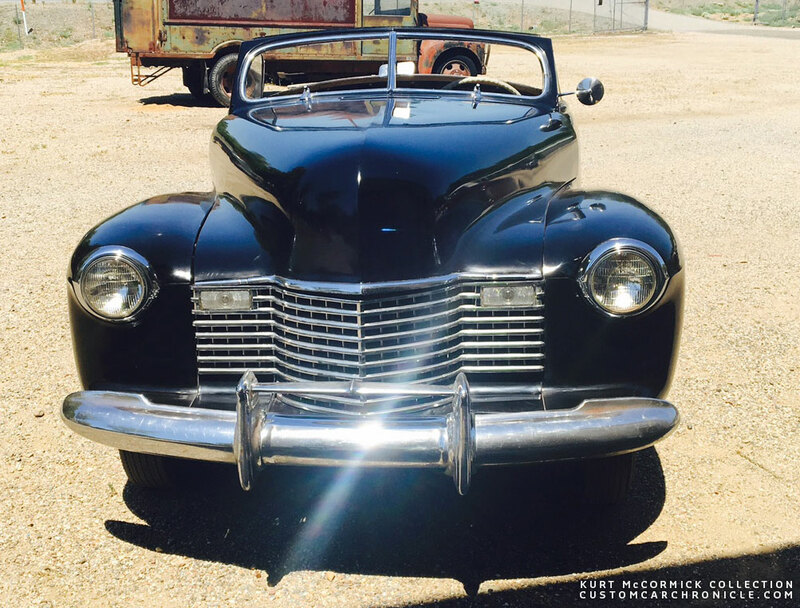 These three photos taken just after WWII show wonderful mix of styles on this classic looking 1941 Cadillac Convertible. This padded top is unlike most we know coming from Carson, Hall, Chavez or a few others, not covered with white canvas. But rather with a dark almost leatherette kind of material. Something similar to what was used by the Coachbuilders to cover metal tops on sedans or coupes for a more exclusive look. But clearly the top on this Cadillac is a lift off unit. It could also be possible that a dark canvas was used which was covered with a special coating to make it look like leather. An other technique sometimes used on coachbuilt cars. We now know that the top, as well as the interior was handled by Hall of Oakland. The rear fenders were modeled to the body, a typical Custom touch, and at first glance it looks like there are no taillights. The stock units were removed along with the fender trim. Below the bumper a set of hidden taillights are just visible. The back of this 1941 Cadillac is extremely clean. A lot of efforts were taken to get the desired look. The taillights were removed and custom taillight units mounted below the bumper just outside of the bumper guards. 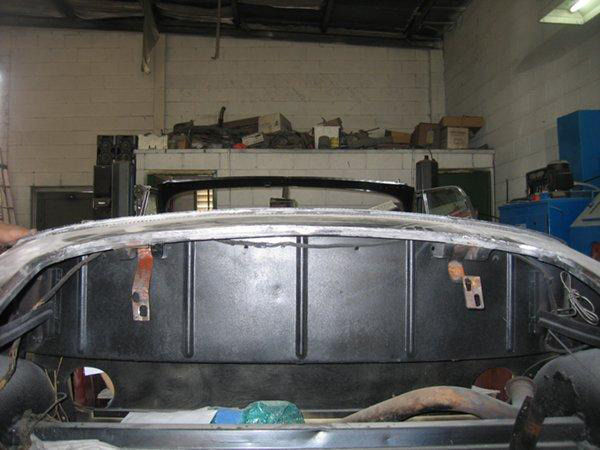 The rear fenders were molded to the main body. 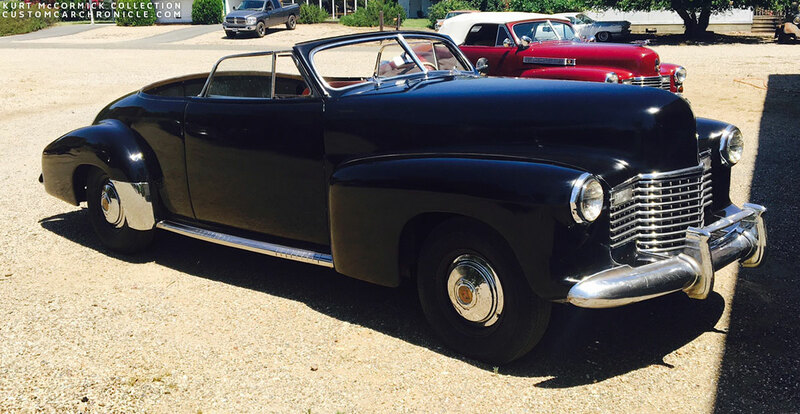 The trunk lid was shaved of the trim, handles and hinges and received a set in license plate. This all leads to an ultra smooth wonderfully shaped rear. 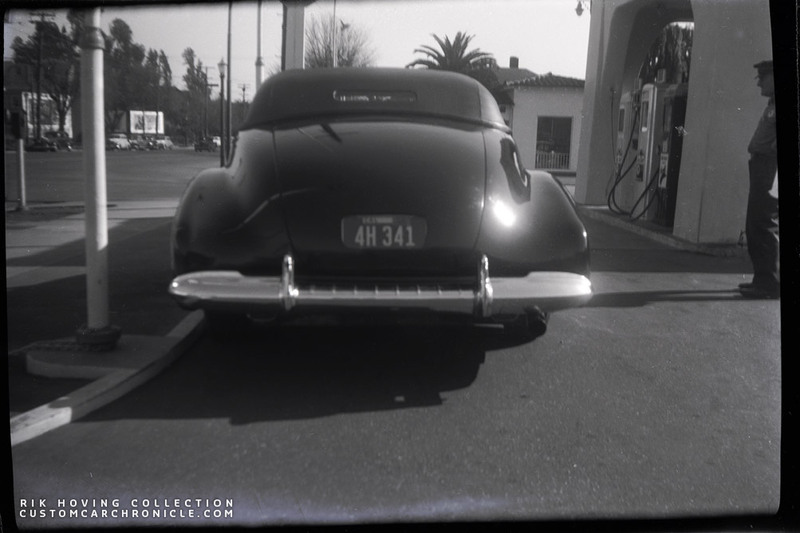 The photo shows the mid 1940’s gas station and streets of an unknown California place. 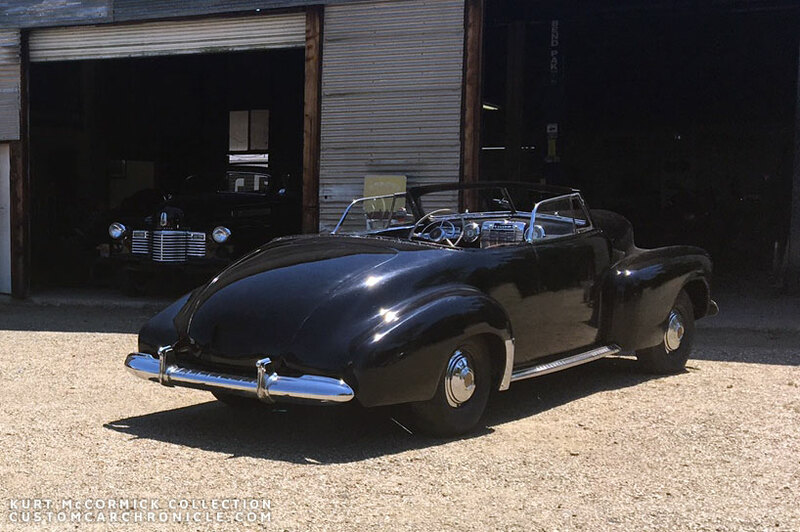 In early July 2016 we received some additional 1940’s photos of this early Custom Car. David Zivot had been talking to the current owner about the Cadillac. He send us some quick snapshots taken with the phone of a collage on his garage wall. 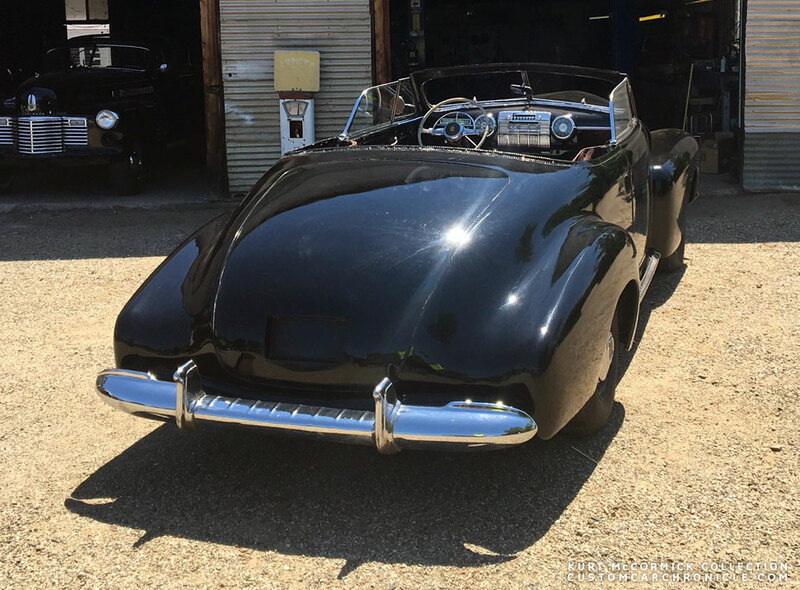 They are not the best quality, but it is really great to see some more photos of this amazing nice and very early Classic Custom. Especially nice is the one color photo that shows us the taillights below the rear bumper. David also mentioned something about the missing Hall top. When the current owner of the Caddy bought the car in 1953, he did not like the style of the black pyroxylin (leatherette) covering on the padded top, so he had Hall Tops re-do it in the typical white stay-fast covering. Then, years later the house he was storing the top in caught fire, badly damaging the top and framework. Some time after that he also re-worked the sunken license plate area because of the cops getting after him about the plate not being visible enough. Color photo is most interesting since it really show the below the rear bumper mounted taillights really well. In all the other photos the taillights are very hard to see. 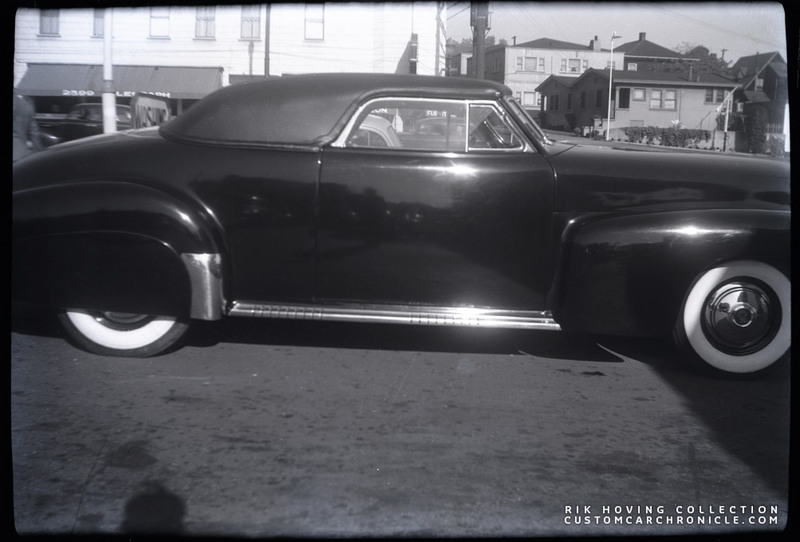 These photos of the car most likely pre-date the three negatives that I found a few years ago. White wall tires were very hard to come by during WWII, so most likely the car was first fitted with black wall tires as we can see in these photos. Wayne Hadfield identified the location two, or possibly all these photos were taken. Using Google Street View he was able to identified the location as 2592 Telegraph Road, Berkeley, CA. Thanks Wayne. The houses in the photo appeared to him as typical NorCal houses, and that where he started his search. Pretty amazing he was able to find it. In 2016 the Cadillac is mostly restored. 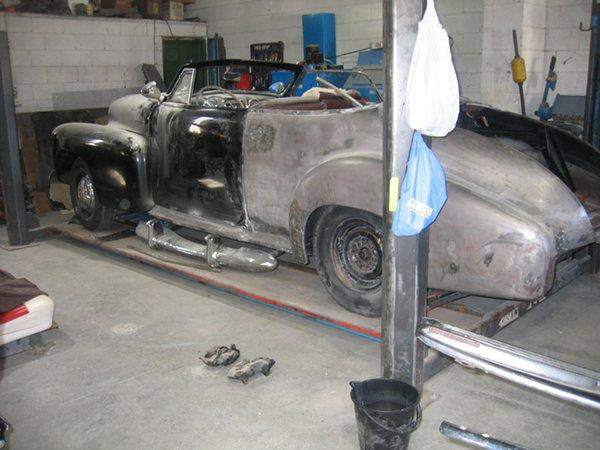 The body is completely restored and the car is running and driving. However it still needs a top, complete upholstery and glass. The Cadillac still looks mostly the same as is does in the three old photos shown in this article. 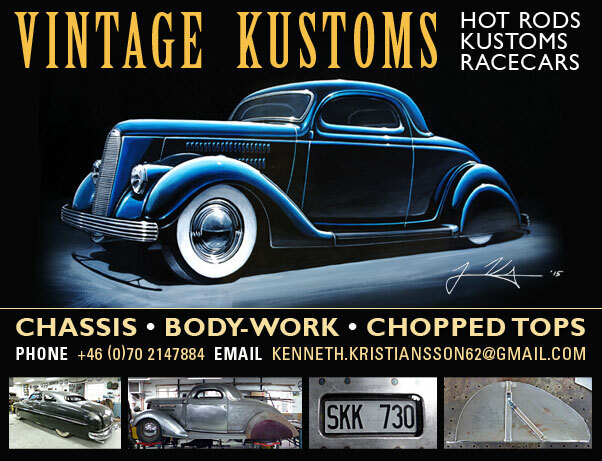 In July 2017 the car was sold to a new owner in Australia who plans to finish the restoration of the car as an early Custom Car. July 20, 2017. 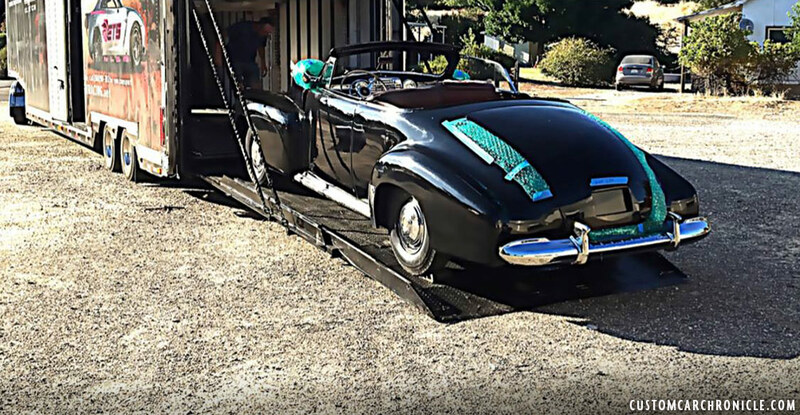 The Cadillac has been prepped for shipping and is picked up to be delivered to the shipper who will place it in a container and ship it to Australia. 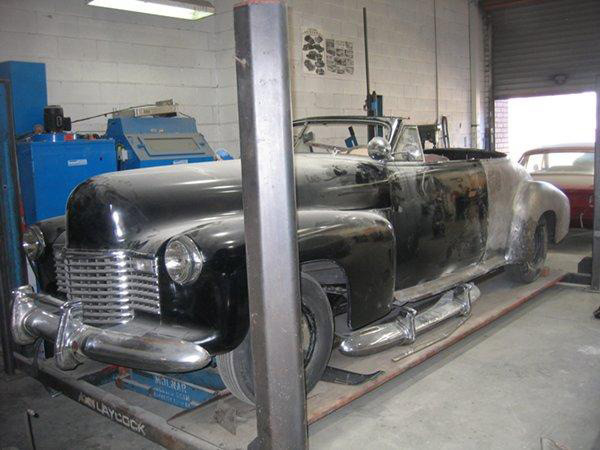 January 2018, the Cadillac has arrived in Australia and the restoration process to get it back to how it looked back in the early 1940’s has started. New hidden hinges from unknown origin were added in the 1940’s. Good looking car, and completely unfamiliar to me too. It would be great to learn more of its history. Great car and made even better by the fact that it is still around. 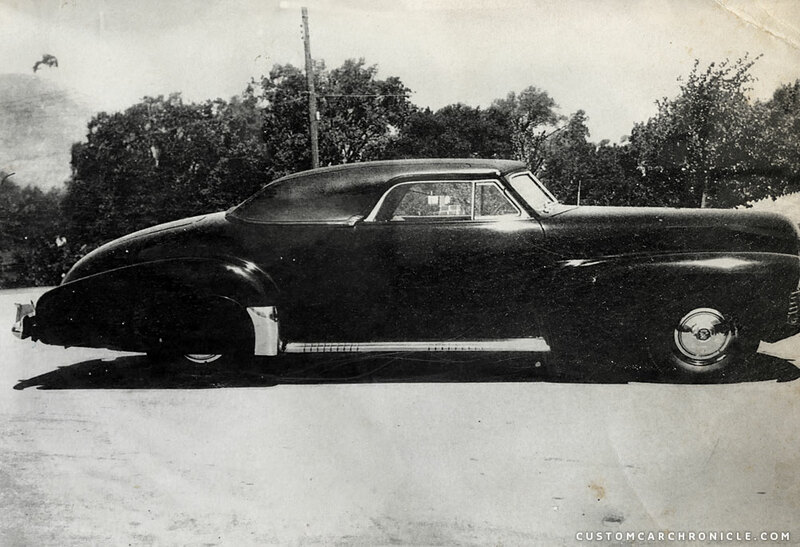 That era Cadillac and Buick c1941 or so just made the quintessential custom cars to me. No Quentin pun intended. Life is good when rides like this rolls out of hideaways , mindblowing that its still around ! Shaved hood , fenders , doors and internal trunklid hinges , tons of work making that Cadillac smooth , hope it finds the right costodian that treats with care to its history , this is a holy grail of the few custom gems left from the fourties custom era ! I remember reading the original article and really liking the dark top and look of this car. It’s wonderful that it is still around! Price doesn’t seem crazy considering it’s an original kustom. Thanks for the info Kurt and another great article, Rik. This one definitely inspired me. Love them custom Cads. Looking at that smooth rump makes me wonder if I should weld the guards on. . . ???? Hope it’s going to a good home and the top is reinstalled. I’m a convertible man, bit there is something about those Carson tops. Was it actually a Carson or a Hall or ??? It was an Hall top, and it was heavily damaged in a shop fire. Should have read the additional info. I am pleased to think it’s a Hall top. . . .
Amazing the difference the skirtsor, lack of, make. Palle, man up get your cheque book out. Very excited to see another Hall Top, Nor-Cal car. I hope some more history is uncovered on it! Hi Rik …. My son in law has purchased this car..he will finish it to the required standard for this car ( Pebble beach) or better…..